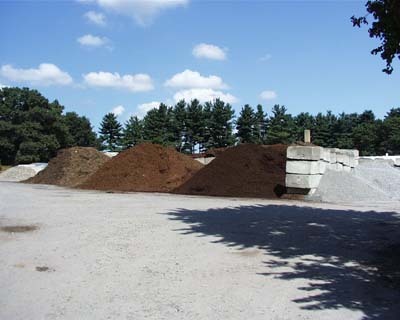 Do you enjoy doing your own mulching and landscaping but need material? Don's Lawn and Landscaping will deliver premium hardwood, dark, double ground mulch to your door with no added delivery charge within a 12-mile radius of our office. We do have a 4 cubic yard minimum for 'Free' delivery. We can deliver smaller amounts but we have to add an additional delivery charge. We also will deliver outside the 12-mile delivery radius with an additional surcharge based on the added distance. Check the map below to see our local delivery radius. It all comes down to the number 27. There are 27 cubic feet in a cubic yard. This means that 1 cubic yard spread out 1 inch thick will cover 324 square feet. From this we can figure out how much mulch you need. It boils down to this: Measure how many square feet of area you have to cover and multiply the total square feet times the depth that you want to apply the material (usually 2 to 4 inches for mulch) and divide that number by 324. The answer will be the amount of mulch that you need! So, the equation is as follows: Total ft sq x depth of application / 324 = cubic yards required. An example would be, you have 1000 sq ft of bed area and you want to apply mulch 2 inches thick: 1000 x 2 = 2000 divided by 324 = 6.173 cubic yards. If you have any questions or need help figuring out the amount of material that you need, feel free to contact us. We would be glad to assist you.